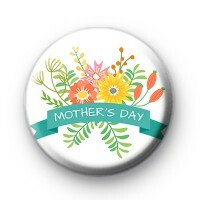 Pretty white 1-inch badge with a gorgeous floral design and Mother's Day written in a simple font inside a turquoise banner. This is a fun badge to give to your Mum to let her know that you love her & think she is awesome. Our badges make lovely handmade gifts for Mother's Day.